Do you like mens vintage style shoes that look like they are worn by the actors on the "Boardwalk Empire". 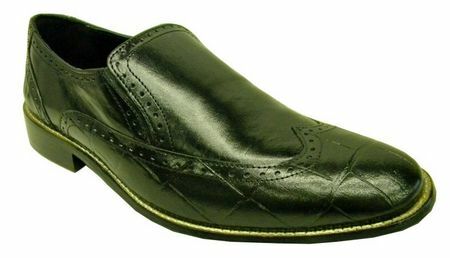 A pair of slip on wing tip shoes that have rich calfskin leather with Crocodile print leather wrapping around the rest. These all black wing tip vintage style slip on shoes by Giorgio Brutini may just be the vintage style that you are looking for. Featuring a rounded wing tip toe style and full leather sole. These shoes will give you that prohibition look that you are looking for. Don't forget to shop online here of for the latest selection of Mens Suits. Zoot Suits make a party happen.